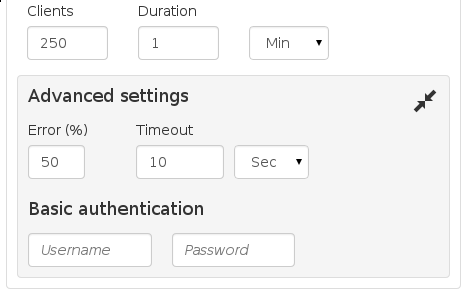 How does the timeout setting work? When creating a test you can set a timeout value by clicking on the "Advanced settings" button. This setting indicates a timeout value that loader.io uses when waiting for responses from your app. If the client does not receive any data for this amount of time (10 seconds by default), then it is counted as a timeout. Note that this may not correspond with the timeout of your server - some servers have a higher timeout, often 30 seconds or higher. What does Timeout in Error mean?